Over the past 20 years Vintage Jag Works has developed our C-Type Replica into a fine vintage machine. 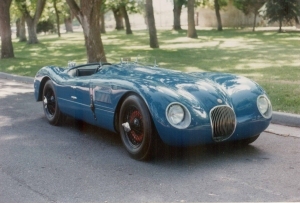 Only 54 C-Types were built by Jaguar during the early 1950's and a real C-Type is now valued at over one million dollars. The overall idea of our replica is to look at, touch, drive and experience a vintage machine without risking a million dollar piece of art. Our car has the same look, size and weight of the real C-Type. Each car we build is hand-crafted for a specific customer. While our car is a true replica, not a "kit car," it is available in several stages of completeness from bare chassis and body panels to a turn-key car.